Most Americans understand that climate change is real and are concerned about it. But most still see climate change as a far away threat, in both time and place, and as something that threatens the future of polar bears but not necessarily people. The reality, however, is starkly different: climate change is already causing problems in communities in every region of our nation, and from a doctor’s perspective, it’s harming our health. Most Americans are not aware of the health harms of climate change. A recent survey showed that most Americans have not considered how global warming might affect people’s health, and few (32%) can name a specific way in which climate change is harming our health. Few are aware that some groups of Americans—including our children, our elders, the sick and the poor—are most likely to be harmed by climate change. None of these survey findings are surprising. There has been relatively little public discussion of the health harms of climate change. But we also know people are eager to hear from us. Most survey respondents said, in fact, that their primary care physician is a trusted source for information about this topic. 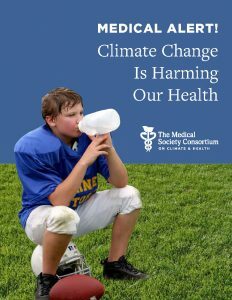 We—physicians in medical societies representing over half of the nation’s doctors—see a need to share our growing understanding and concern about the health consequences of climate change with all Americans.